By Sarah Sharp, Assistant Editor. We are delighted to introduce Professor Andrei Yudin as Chemical Science Associate Editor, handling submissions in the area of organic chemistry. Andrei is a Professor of Chemistry at the University of Toronto, where his group specialise in chemical synthesis with a focus on the preparation of novel biologically active molecules. Andrei and his group pioneered work on the preparation of amphoteric reagents, developing structurally distinct intermediates that were viewed as impossible to prepare prior to their studies. The group have been highlighted for the preparation of a library of difficult-to-prepare azridine aldehydes and α-boryl aldehydes that can be applied in the preparation of medically relevant peptidomimetics. 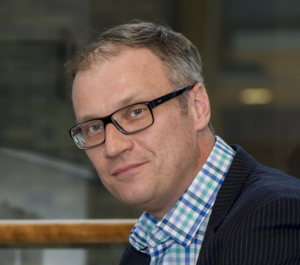 Andrei is the current Editor-in-Chief of the Royal Society of Chemistry journal, Organic & Biomolecular Chemistry, and runs a blog series providing regular updates on the progress within his group, found at https://amphoteros.com/. Andrei has now joined the team at Chemical Science and looks forward to receiving submissions in the areas of organic synthesis, transition metal catalysis, peptide preparation and macrocyclisation.